Professor Ian Alexander, 63, from Burnhervie, near Inverurie, joined the University in October 1971 having obtained an undergraduate degree and PhD from the University of Edinburgh. He was appointed keeper of the Cruickshank Gardens in 1992 and Regius Professor of Botany in 1996. He was elected a Fellow of the Royal Society of Edinburgh in 1997. Professor Alexander’s research has focused on plant ecology and the interaction between plants and mycorrhizal fungi, which form mutualistic associations with plant roots and have a beneficial effect on plant growth and development. It has taken him across the world from the tropics of Malaysia and south-east Asia, to West Africa and Spitzbergen in the high Arctic. Professor Alexander said: “The mutualistic interaction between plants and mycorrhizal fungi is an essential part of a functioning ecosystem and has held my research interest for almost four decades. In addition to his research and teaching responsibilities, Professor Alexander helped to set up the University’s Natural History Centre in 1995. It is an environmental education centre which aims to increase public interest in the living world, running a host of free events at the Cruickshank Gardens, Zoology Museum and Duthie Park which attract hundreds of people each year. Professor Alexander said he had enjoyed his time as keeper of the Cruickshank Botanic Gardens, founded in 1898 with a bequest from Miss Anne Cruickshank, given in memory of her brother Dr Alexander Cruickshank. “The Cruickshank Gardens hold a nationally important living collection of plants. 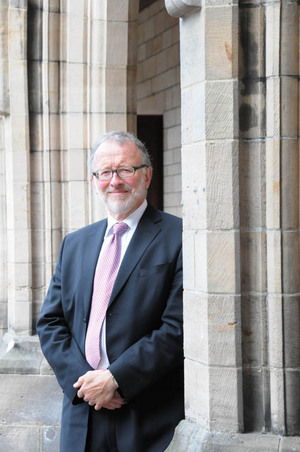 They are a very important part of the University’s heritage and of the environment of Old Aberdeen,” he added. When he retires from the University, Professor Alexander expects to keep up his research interests but will be able to dedicate more time to his role as editor of the journal The New Phytologist, and to his own garden. He will also spend time with his family who have followed in his academic footsteps with wife Clare a fellow botanist teaching at Aberdeen College, son John studying for a PhD at the University of Aberdeen and daughter Kirsty working for the University of St Andrews.